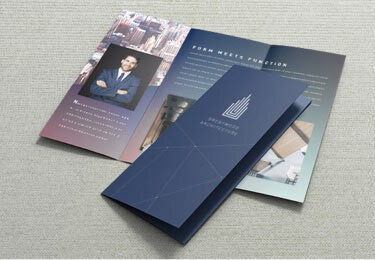 11" x 8.5" brochures are a great way to showcase all of your company's services in one handy pamphlet. The two sided printing gives you plenty of room to tell potential clients about your competitive advantages. Two stocks to choose from: 100# white glossy stock to make your photos really pop or 80# Natural White Linen stock for a more polished and professional look. Our Brochures ship out in 2 business days and come pre-folded so they are ready to hand out when you receive them!